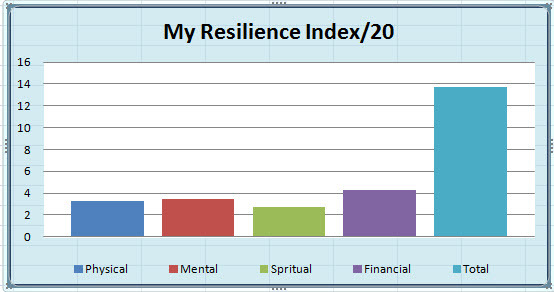 How High Is Your Resilience Index? This new direction would require us to sell our much loved vacation property, pull up roots from nearby loved ones and friends, and start anew in a location that would likely serve our needs better in the medium to long term. To cement our resolve, we emailed our friends Milt and Diane, to let them know of our intent to join them in the Okanagan Valley. Along with most family and friends, they have been our champions. My coaches Martin and Craig have also been instrumental in helping me to hear myself, probe my own motivations, and plan a way forward. Big decisions like this are not to be taken lightly. They will tax you emotionally, physically, and financially. They require focus and perseverance supported by resilience. Wikipedia quotes: Psychological resilience is defined as an individual’s ability to successfully adapt to life tasks in the face of social disadvantage or highly adverse conditions. 1. How motivated are you? Is your ambition a casual impulse, or an enduring willingness to walk accross a bed of hot coals to get there? Can you see yourself accomplishing your goal? What is the greatest benefit? Score:_____. 2. How Adaptable Have You Been In The Past? Have you demonstrated resilience to change and adversity? How big were the situations compared to this decision? When were you tempted to quit? SCORE:_____. 2. How Deep Are Your Resiliency Reserves? How strong are you right now? Are you able to sustain the possible twists and turns that you have identified, or haven’t even thought of yet? Will your challenge be primarily physical, emotional, spiritual, relational, or financial? Where are you vulnerable? What do you need to do to deepen your resiliency? Score:______. 3. Who Is In Your Corner? We had two on call mechanics that assisted us as we trailered GUST-O accross North America. Who is supporting you? Do they have skills or endurance in areas that compliment you? Who will oppose you? How will you respond? How much energy will be required? How does your Significant Other score on these points? Are you both on the same page? Score:______. Did you score at least 14/20? If not, what would it take to move there? Which category would you be able to move the easiest for two more points? In the Bible it is written: “Not only that, but we also rejoice in our sufferings, because we know that suffering produces perseverance;perseverance, character; and character, hope.” (Rom 5:3-4). So, here we are, six months later. Brown Eyes and I sailed back to America, across Florida on the Okeechobee River, drove over 10,000km, sold our Montana vacation property, bought a new home in the Okanagan Valley, bid farewell to friends and family, and crossed the Rogers Pass seven times to bring GUST-O and all of our belongings here. It has been an exciting ride, complete with unexpected trials and blessings. We now need to just be immersed here for a while to get settled into a new life, and to overcome that dab of lingering doubt that often accompanies these decisions. We also need to refill our resilience reservoirs in order to take on the next Big Thing. If you think that your Resilience Index could use some collaborative reinforcement, I am confident that I can be of assistance to help you to See…Act..and Live Your Vision.